Alternative sources of energy, such as solar power or wind power, are not a new concept. Man, through his research and ingenuity, has been able to harness some of nature’s very own energy reserves and has put it to his use. Continuing research in these fields is constantly improving the technology of harnessing the power of these natural elements. Solar energy systems have met with tremendous improvement in recent years. So have wind power systems. A modern day windmill power generator system is potent enough to supply sufficient power to keep an entire household running. In some cases, they may even produce power in excess of the actual requirement, giving the owner of such a system the opportunity to sell back the surplus to the local power supply company. Indeed, wind power systems have come a long way. Owing to their increased affordability and improved performance, more and more homes across the <?xml:namespace prefix = st1 ns = "urn:schemas-microsoft-com:office:smarttags" />US and in other regions of the world too, are embracing wind power systems to generate clean, cheap power. Wind power systems require very little to start producing useful electricity. After the initial set-up is completed, these virtually maintenance-free systems use the power of the wind to turn the turbine, activate the dynamo and generate plenty of electricity for all kinds of domestic application. The best thing about choosing wind power for your home is the fact that you will actually be cutting down on your energy bills substantially. Depending on the strength and capacity of your personal wind power system, you stand to reduce monthly electricity bills by as much as 90%! So how does wind power for your home work? Well, all wind power systems, in spite of their varying shapes and sizes, operate on the same set of principles. In its most rudimentary form, they consist of a tower with a five-blade turbine to create energy from the wind. How tall the tower would be depends on the location of your house. If you happen to live in a particularly windy area (such as near the sea), you can get away with a shorter tower, whereas a zone with weaker winds would require a taller one. As a rule of thumb, you must have the wind blowing at around 11 km/hr to unleash the full potential of a typical wind power system. Anything less than that would probably produce disappointing results. A typical system would also include a wind power generator that converts the wind energy (kinetic energy) into electrical energy that can be used for running various domestic electrical appliances. One can even store any excess power generated for later use, making wind power generators a great source for uninterrupted energy even when the winds are not blowing in your favor. This feature certainly makes them more efficient than conventional power systems. 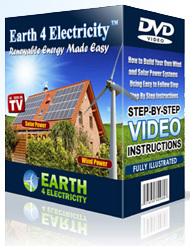 Before deciding to set up wind power for your home, get hold of a good guide. Here is such a guide that will hand hold you and show you through all the critical steps of buying the right equipment, connecting them together, wiring the system and ultimately building a fully functional wind power system all by yourself. You will know where to set it up and how to do it so that your cheap wind power system works best. And you will also learn about the safety precautions.